Reinventing an 80-year-old public housing community and adding mixed-income housing, community space and small business retail. Official construction updates on a new LEED® Gold, 165,000 square-foot office & lab building in Kendall Square. The official site for Boston Properties' Residential and Commercial development projects in Kendall Square. 15 Washington St will transform a surface parking lot and urban retail site to a mixed-use development with housing and a new grocery store. Creating a vibrant walkable village center that offers a mix of housing and commercial choices to better meet locally identified needs. Redeveloping the former Quincy Medical Center site into a residential community with public open space. A mixed-income, transit-oriented redevelopment with a focus on the community. Official construction updates on the Treadmark residential development in Dorchester. 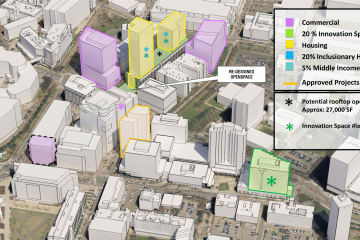 Creating 1 million square feet of new innovation space, offices, and mixed-income housing in Kendall Square. Pedestrian-friendly rental living and neighborhood retail across from the Forest Hills T stop. Shaping a shared vision for the future of Downtown Nashua's historic riverfront.